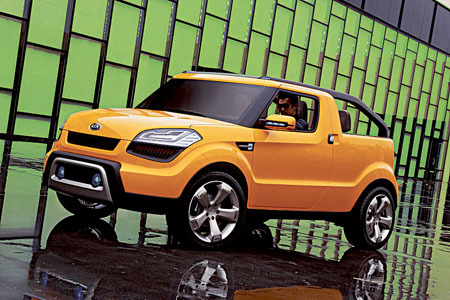 Kia Motors brought a sunny beach feeling to the 2009 North American International Auto Show on cold Detroit winter days with the arrival of the Kia Soul’ster open-air concept, a variation of the highly anticipated Kia Soul urban crossover. With young-at-heart buyers’ budgets in mind, the Soul’ster is an efficient front-drive car based on the Kia Soul production model, which made its world debut at the Paris Motor Show last October and is another example of Kia’s increased and long-term focus on design. The exciting new Soul range (albeit without the Soul'ster ) will be on sale here from late next month.